Just because the championship monkey is off the backs of the Washington Capitals doesn’t mean the team has forgotten where it came from. In Game 1 of the series with the upstart Carolina Hurricanes, the Caps showed flashes of the team’s former self best known for handing momentum right back to postseason opponents like the world’s stupidest charity foundation. They started as they often do in these kinds of games by appearing almost invincible. 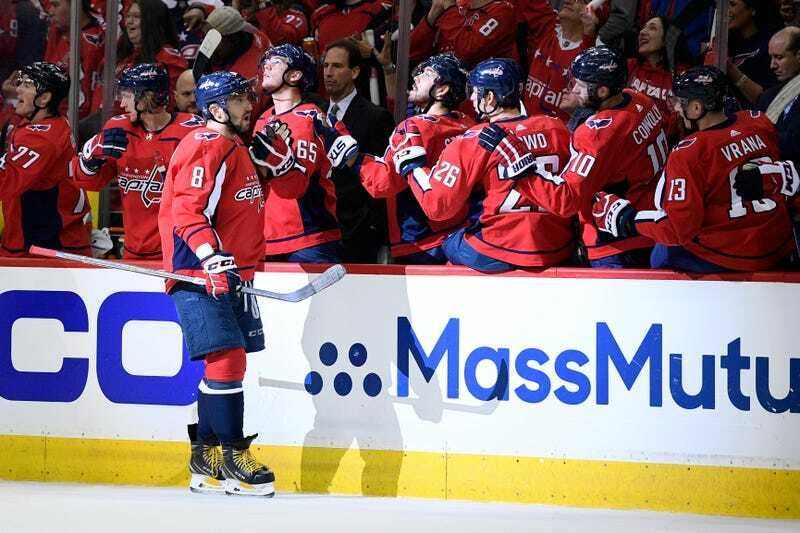 Shortly after the home broadcasters pointed out that the team had yet to get a shot in on goal in the first period, Nicklas Backstrom scored twice within a span of just a few minutes. 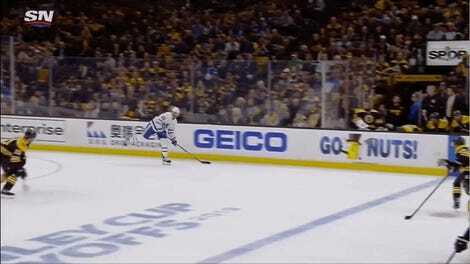 The first was shot from near the top of a faceoff circle and moved so fast that Carolina goalie Petr Mrazek didn’t even react until the puck was in the net. The second happened during a power play when the Hurricanes were so focused on preventing Alex Ovechkin from scoring, that they left Backstrom open right in front of their own net. After seeing how much fun Backstrom was having putting the puck into the net, Ovechkin got in on the scoring action too. Just like his teammate, he would score during a power play from his usual spot. This goal was definitely a lot more deflating than the others because it came on Ovi’s third consecutive shot attempt after Mrazek made two pretty decent saves. Even lazy mistakes would end up bouncing in their favor. However, that probably should have been a clue to Caps coach Todd Reirden, in hindsight, that things were about to turn. As the second period went on, Washington relied on the heroics of Braden Holtby more and more, and while he was more than capable of making most of the stops he needed to make, Carolina was clearly getting some of the momentum back that it had lost earlier. Then the third period happened. Five minutes in, the Caps had two back-to-back scoring chances that they should have easily converted. After Mrazek’s second save, Carolina turned and simply beat the defense down the ice. Hurricanes center Lucas Wallmark dumped the puck off to Andrei Svechnikov, who fired a shot past Holtby for Carolina’s first goal of the game. Carolina’s second goal also came as a result of laziness from Washington. Hurricanes defenseman Justin Faulk fired the puck towards the boards behind Holtby and Wallmark timed his run to get there before anyone from the Caps could. A disorganized defense from the home squad left Svechnikov wide open to score his second goal of the game, and cut Washington’s lead down to just one. But that shouldn’t have mattered, right? The defending Stanley Cup champions should be able to protect a one-goal lead at home despite having all momentum charging against them. So, to make things harder, the Caps gave away two power play opportunities to their opponents who finished the season with the most high-danger scoring chances. This fact resulted in play after play that gave Caps fans some serious heart palpitations. But the statistics eventually pulled through for Washington—Carolina’s second-worst conversion rate of high-danger scoring chances in the league was also apparent during this stretch—and they snuck away with a 4-2 win shortly after Lars Eller shot on an empty net went in. If this game is any indication of how the rest of the series is going to go, it means that the Caps are definitely going to win this season in less than seven games—they’re just going to kill some of their fans with weak hearts in the process. Ah, just like old times.